nanobugs® | Did you know? It is Influenza Season in the Southern Hemisphere? 29 Jun Did you know? It is Influenza Season in the Southern Hemisphere? Did you know? It is Flu Season in the Southern Hemisphere. The season occurs during the cold half of the year in each hemisphere. During periods of cooler temperature, influenza cases increase roughly tenfold or more. Despite higher incidence of manifestations of the flu during the season, the viruses are actually transmitted throughout populations all year round. The exact mechanism behind the seasonal nature of influenza outbreaks is unknown. •	Vitamin D production from Ultraviolet-B in the skin changes with the seasons and affects the immune system. •	Humans ingest more fresh probiotic foods in the warmer months that “feed” and balance a healthy microbiome and supports immune function. •	Research in guinea pigs has shown that the aerosol transmission of the virus is enhanced when the air is cold and dry. •	People are indoors more often during the winter, sharing air and environmental surfaces with other individuals who may be infected or incubating the infection. •	Viruses are preserved in colder temperatures due to slower decomposition, so they linger longer on exposed surfaces (doorknobs, countertops, etc.). •	In countries where children do not go to school in the summer, there is a more pronounced beginning to flu season, coinciding with the start of public school. It is thought that the day care environment is perfect for the spread of illness. Did you know? Each annual flu season is normally associated with a major influenza virus subtype. The associated subtype changes each year, due to development of immunological resistance to a previous year’s strain (through exposure and vaccinations), and mutational changes in previously dormant virus strains. 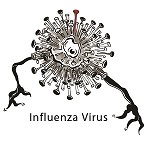 If you live in the Northern Hemisphere and are responsible for prevention of seasonal influenza, let me introduce you to the Influenza Virus nanobug. His mantra is “It gives me a kick to make you sick!” Plan now to use this “microbe with attitude” to help you engage populations at risk of seasonal influenza (diabetics, elderly and immune-suppressed individuals, health care workers and child care providers). Our goal is to vilify the microbes and unite homo sapiens in strategies to sabotage them. Christmas is July? To encourage you to plan your strategy now for the 2017-18 season, Nanobugs, inc is offering influenza tattoos (bulk) in BOGO fashion: buy 100 and we will send you 200. And the same for the “Say Boo to the Flu” Halloween “treats”. If you buy the Nanobugs Flu Prevention Kit in July, we will double the temporary tattoos in the kit. Shop at www.nanobugs.com.